It's been a crazy couple months (in my world, this means it's been super fun). Since I last blogged here, I closed up my Kindermusik toddler music business. I began teaching adult fitness classes. I completed my Youth Exercise Specialist Certification. 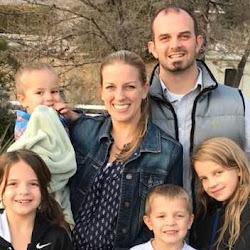 I organized a soccer team with local homeschoolers so my 6 year old could try out the sport and I could schedule practices for the daytime instead of the evenings. I launched a new blog (3fitmoms.com) with a couple super awesome mommas. I began taking a course for my prenatal and postnatal fitness certification. I created and launched a Little Dragons program for toddlers at the martial arts gym where I train (think a fun fitness class for littles with a martial arts influence-they're the cutest). I earned my brown belt. And I changed over most of our homeschool curriculum. 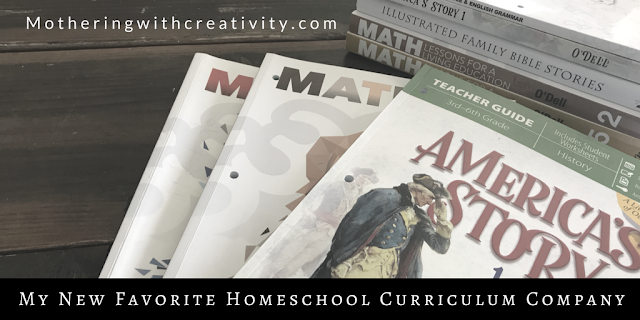 Since I've so often shared with you the ins and outs of our homeschool day and the curriculums I use, I thought it only reasonable that I update you with our new, absolutely amazing, can't-believe-I-hadn't-found-it-sooner, homeschool curriculum. Truly. This curriculum has been life changing and life giving in our homeschool. Last year, I gave the Master Books math (Math Lessons for a Living Education-MLFLE) a shot for my math struggler- my 10 year old. Math has just always been difficult and challenging for her. We had started out with A Beka, which worked until about 3rd grade, at which point the 2 hours a day it took her to complete the assignments were just a nightmare. We had tried some others in between, but nothing that really met her needs in a way that made her feel successful and helped her to continue progressing and retaining new info. This curriculum immediately changed that for her. It is Charlotte Mason based, meaning there are stories to start the week. They are faith based, meaning it reinforces biblical concepts throughout, and it has short assignments-"ask less but require more." The page may only repeat a problem 4 times, but she is able to talk me through it, explain what she's doing and why, AND of course, find the right answer. She began completing her assignments without tears, making progress, and even starting on math without me asking. After a few months, we switched the other kids over to this math curriculum, too. They all love it and are thriving. We quickly followed it up with their science (zoology) and history (America's Story) curriculums-they are amazing! I do these two subjects with all the children at the same time. We follow them up with art (like drawing the animals we read about) or acting out a scene from history, or Youtube videos to further explain a particular concept they were particularly interested in exploring. For Bible, we bought their apologetics books for kids and I've found that even though it's written for the children, I have really enjoyed it and been challenged by it. We often read through 3-5 days of these books at a time because the kids love it so much. Lastly, and most recently, we switched our 10 year old over to their language (Elementary Bible & English Grammar). This one has by far been my favorite move. While I love A Beka for learning to read and grammar basics, it drills to death diagramming sentences. She was bored. I was bored. It sucked. This company uses a Bible story book for language and grammar for her age, and it is INCREDIBLE. Her grammar assignments are tied to sentences from the stories, her activities often relate to family life or creating a project based on one of the stories, her writing assignments are sometimes a reflection on particular scriptures she read, and her vocabulary comes from the Bible stories as well. It's meaningful and practical and accomplishes so much all in one. Absolutely amazing. Master Books just released a few new Living Education Language books for younger grades, which I have yet to try but am eager to do so for my younger kids. *Bonus-There is a "Moms of Masterbooks" group on FB where moms can chat with each other and even directly to the authors/publishers! I truly wish I had found this curriculum early in our journey. It has changed the atmosphere in our school day and has helped our children grow so much. I highly recommend checking them out!